168 Beacon is located on the north side of Beacon, between Berkeley and Clarendon, with 166 Beacon to the east and 170 Beacon to the west. 168 Beacon was built ca. 1861, one of two contiguous houses (168-170 Beacon) built for Robert Maynard Cushing and his older brother, John Gardiner Cushing. They were sons of John Perkins Cushing, a partner in the shipping merchant firm of Perkins & Company founded by John P. Cushing’s maternal uncle, Thomas Handasyde Perkins. John P. Cushing served as the firm’s agent in China for thirty years. After returning to Massachusetts, he built an estate, Bellmont, in a portion of Watertown which later became the town of Belmont, named after the estate. The land on which 168 and 170 Beacon were built was purchased by the Cushing brothers on October 7, 1861, from real estate dealer Henry Whitwell. Robert Cushing purchased the land for 168 Beacon, where he built his home, and John Cushing purchased the land for 170 Beacon, where he built his home. The land originally was part of two parcels purchased from the Boston and Roxbury Mill Corporation on June 7,1860, one by real estate dealer Henry Whitwell, and the other, immediately to the west, by shipping merchant and real estate investor John Lowell Gardner. On March 6, 1861, John Gardner sold the eastern part of his parcel to Henry Whitwell, who then sold the western two-thirds of his expanded lot to the Cushing brothers. John L. Gardner and his wife, Catharine Elizabeth (Peabody) Gardner lived at 7 Beacon, and would build a new home at 182 Beacon in the mid-1860s. Henry Whitwell was unmarried and lived at 79 Beacon with his parents, Samuel Whitwell and Sophia (Story) Whitwell; they moved to 161 Beacon in the mid-1860s. In the Appendix to his Houses of Boston’s Back Bay, Bainbridge Bunting indicates that 168-170 Beacon were built for John Lowell Gardner and acquired by the Cushing brothers after they were completed. Based on the deeds, however, this is not correct. Click here for an index to the deeds for 168 Beacon. Robert Cushing married in April of 1863 to Olivia Donaldson Dulany, and 168 Beacon probably was their first home together. They also maintained a home, The Ledges, in Newport. During the 1882-1883 and 1883-1884 winter seasons, the Cushings were living elsewhere and 166 Beacon was the home of investment banker George Cabot Lee and his wife, Caroline Watts (Haskell) Lee. They also maintained a home in Chestnut Hill. By the 1884-1885 season, the Lees had moved to 196 Beacon and the Cushings were again living at 168 Beacon. They continued to live there in 1891, but were again living elsewhere during the next two winter seasons. During the 1891-1892 winter season,168 Beacon was the home of lawyer Francis Inman Amory and his wife, Grace Josephine (Minot) Amory. They previously had lived at 82 Marlborough. By the 1892-1893 season, they had moved to 413 Commonwealth. During the 1892-1893 winter season, 168 Beacon was the home of Walter Channing Cabot and his wife, Elizabeth Rogers (Mason) Cabot. Their usual residence was in Brookline. A civil engineer by training, he owned and managed cattle ranches. Robert and Olivia Cushing resumed living at 168 Beacon by the 1893-1894 winter season. The Cushings four children — Grafton Dulany Cushing, Mary Louisa Cushing, Howard Gardiner Cushing, and Olivia Donaldson Cushing — lived with them. Mary Louisa Cushing married in December of 1899 to Edward Holton James and they moved to Seattle, where he became a lawyer. Olivia Cushing married in January of 1902 to Andreas Anderson, an artist. He died in February of 1902 and she moved soon thereafter to Rome, where she became a playwright. Howard Cushing, a portrait artist, married in November of 1903 to Ethel Cochrane. After their marriage, they lived in Brookline and Newport, and later in New York City. The Cushings’ unmarried son, Grafton Dulany Cushing, continued to live with them. He was a lawyer and in 1915 would become Lieutenant Governor of Massachusetts. Olivia Cushing died in April of 1906 and Robert Cushing died in January of 1907. Grafton Cushing continued to live at 168 Beacon until 1908, when he moved to 20 Chestnut. In 1908, 168 Beacon was briefly the home of William Fisher Wharton and his wife, Susan C. (Lay) Wharton. They had lived at 181 Beacon the previous year. 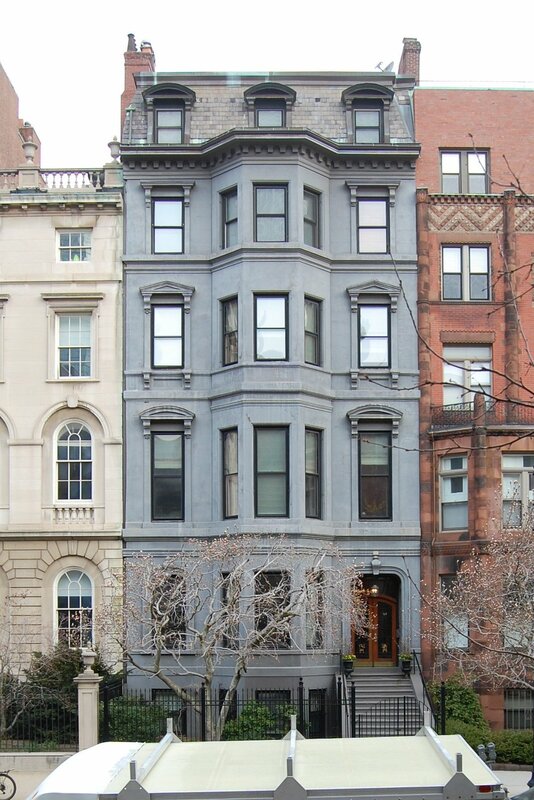 They also maintained a home in Groton, which appears to have been their sole residence until about 1911, when they acquired 169 Beacon as their Boston home. On April 24, 1908, 168 Beacon was purchased from Robert Cushing’s estate by George Richmond Fearing, Jr.
By the 1909-1910 winter season, George Fearing, Jr., and his wife, Hester (Cochrane) Fearing, had made it their home. They previously lived at 927 Boylston and in Westwood, where they continued to maintain a home. Hester Fearing was the sister of Ethel (Cochrane) Cushing, the wife of Howard G. Cushing. George Fearing was an investment banker. He also served as President of the Free Hospital for Women from 1910 to 1936. George Fearing died in June of 1956. After his death, Hester Fearing made her home in Westwood. On September 11, 1956, 168 Beacon was acquired from George Fearing’s estate by Fred L. Arata and his wife, Annette Flossie (Crovo) Boggiano Arata. He was a liquor dealer and real estate investor; they lived in Brighton. 168 Beacon appears to have remained vacant. On May 13, 1960, 168 Beacon was acquired from Annette Arata by Emerson College. In July of 1960, it applied for (and subsequently received) permission to convert the property from a single family dwelling into a school and offices. By 1961, it had moved its Samuel D. Robbins Speech and Hearing Clinic from 145 Beacon to 168 Beacon. On July 16. 1997, William R. Haney, Sr., trustee of the Beacon Three Realty Trust, purchased 168 Beacon from Emerson College. 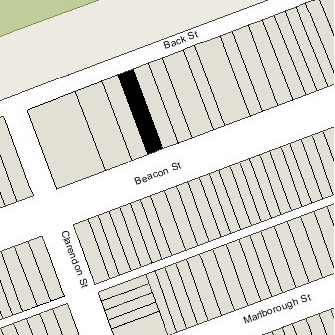 On August 15, 1997, he sold the property to the 168 Beacon Street Associates LLC (Ferdinand J. Kiley, IV, manager) and on the same day, the 168 Beacon Street Associates LLC applied for (and subsequently received) permission to convert the property into three apartments, with a garage for six vehicles. 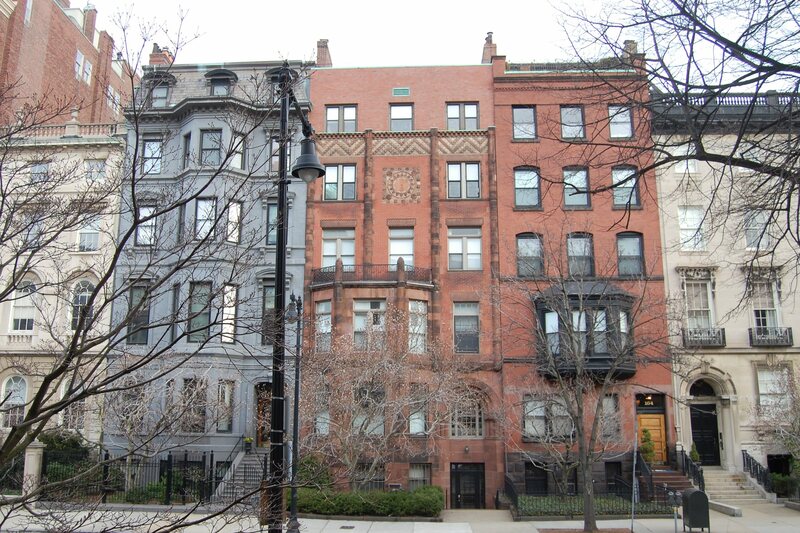 On July 15, 1998, the 168 Beacon Street Associates LLC converted the property into three condominium units: the 168 Beacon Condominium.